Regulators are proactive referees of the sectors they regulate, contributing to the delivery of essential public utilities for citizens. To fulfill this function, they need to be constantly alert, checking sectoral trends as well as assessing the impact of their decisions. However, while measuring regulators’ performance is essential, it is also challenging, from defininig what should be measured to attributing impacts to regulators' decisions. To address these challenges, the OECD has developed an innovative framework that looks at the institutions, processes and practices that help regulators assess their performance. 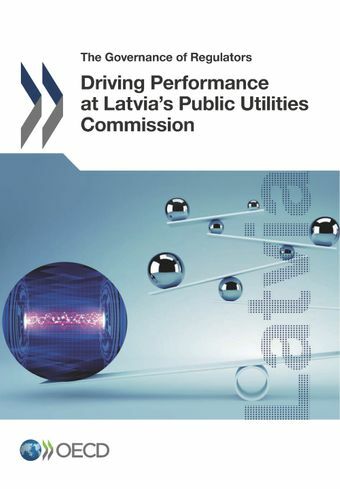 The framework has been applied to Latvia's Public Utilities Commission, which is responsible for regulating energy, communications, water and waste. The review offers unique insights into the work of a multi-sector regulator, identifying the organisational features that allow lessons and experiences to be shared across sectors and contribute to good performance. It highlights the importance of clarifying the role and functions of the regulator and its relationship with other public institutions, setting long-term strategic objectives for the regulator's activities, and having the right regulatory tools with appropriate incentives for the efficient and effective provision of public utility services. The PUC is recognised as an independent and well-performing regulator, effectively using the multi-sector model to pool expertise and facilitate the diffusion of good practices and lessons learned across the institution through a joined-up approach to economic and legal analysis. An overall culture of transparency and public engagement also informs the decision-making process, with public hearings on tariff proposals and systematic consultations and feedback to stakeholders on their contributions when planning regulatory measures. However, the governance environment supporting the work of the regulator can be improved to dispel any risk of undue influence on the work of the regulator, especially in Latvia where the government still controls a number of operators which are regulated by the PUC. Funding deserves particular attention since the level of the regulatory fee that financed the PUC is set by the Cabinet of Ministers, where a number of ministries are shareholders of the regulated public utilities. This procedure creates a potential conflict of interest and can become an avenue for exercising undue influence on the regulator. The impact of a civil-service wide salary cap, to which the PUC is subject, also needs further assessment. Operations and internal structures of the PUC also have important and valuable assets that could be further enhanced. With the expected further opening of the regulated sectors, priorities will need to be set and the appropriateness of regulatory tools reconsidered. The PUC has relied mostly on cost-plus regulation, which does not offer an incentive to operators to improve efficiency. The choice of this methodology is in part motivated by the fact that most operators are state-owned enterprises, which are less subject to economic or profit targets in Latvia, but this is due to progressively change. The PUC’s active involvement in issuing opinions on draft laws and regulations will also need to be balanced against the significant resource commitment and the risk of mixing up policy functions and regulatory functions, if the regulator becomes the main source of analysis for proposed legislation. Data on outputs and outcomes are not yet explicitly linked to key market trends that can be attributed or affected by regulatory interventions. Measuring the quality of internal processes could be further developed and there are also untapped opportunities for using data for improving consumers' choices.